December 4th is the annual celebration of Cossack Women and Mothers. On this day the Orthodox Church also celebrates the entry of the Mother of God Into The Temple. Historically, the Cossack women were not just excellent wives and good housekeepers. The Cossack women were there to raise the family, ensure peace was kept among the Cossacks and defenders of their Stanitsa (Villages) when the husbands were away in service or at war. Without the Cossack mothers, our national identity would have been lost many centuries ago, as many Cossack women fought for the idea of national independence, keeping our history intact, and our traditions safe. Even in times of great danger, times of sorrow, and great joy they were able to carry on their duties as Cossack women and mothers. 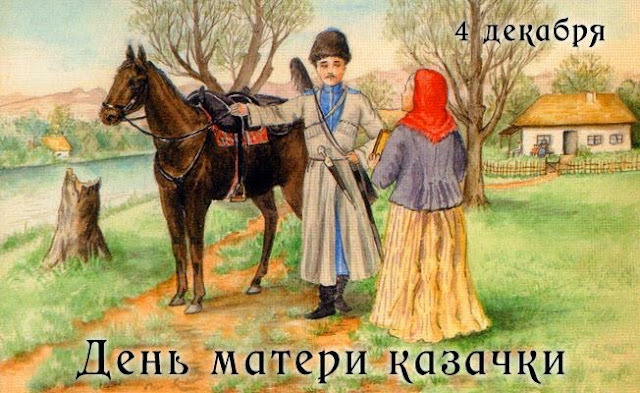 We congratulate all Cossack mothers and women on this day, and wish all many years!